Today, we did it. We got up at the crack of dawn and packed a picnic and headed for Windsor and Eton Riverside, Queen Victoria’s favourite station, where the shuttle bus awaited us to take us to The Olympic Games. Specifically, rowing at Eton Dorney. Oh, the atmosphere. Trailing off the train, even the rail staff were detailed to be accommodating, cheeky and chirpy. There was a most un-British welcome, and the opportunity to be photographed with a bona fide Olympic torch, and slick organisation which bussed us, on large comfortable double-deckers, to the venue itself. There were welcomers. People smiled and looked you in the eye and waved flags. Everyone bade us good morning as we went through security. This was pretend-Britain but it was jolly nice. We were ushered to our seats and watched and cheered two GB wins, taking note of the Big Brother screen, fed by the most ingenious cable-car camera which followed the rowers down the course. He was slow but the crowd got behind him and roared him home. He was not a winner: but he was the star of the day. The weather held, sort of: there were a few spots of rain, black clouds and ominous thunder. But it was sound and fury, signifying nothing. The wildlife might be forgiven for being spooked by the proceedings, but it seemed to be celebrating too: the black headed gulls would fly just ahead of the rowers and then do breathtaking acrobatics , swooping and soaring with every bit as much alacrity as a gymnast on the asymmetric bars. I must not ramble. I have much more to tell you. But for now, here are a few snaps of this rather unexpectedly glorious day. Posted in London 2012Bookmark the permalink. So awesome! I saw a story about the Nigerian rower and the crowd getting behind him. How wonderful that you were there. Thought you might have heard me bawling, Vera 😀 Fantastic morning. Full of the spirit of the Olympics. Will keep my eye out for the Fijiian. The TV coverage over here has been good, but I much prefer this up close and personal story from someone that actually attended. I would have been rooting for the Nigerian rower too. He personifies Olympic spirit plus he’s not a teenager. How refreshing. It was, Lameadventures. They did a TV interview on the huge screen at the end with him. You can find a chaotic recording of this at http://audioboo.fm/boos/901646-isaaka-interview. According to him: he’ll be back. Thanks for sharing the Audioboo link. We failed to get tickets for anything, so I’m not at all peeved by all the empty seats. No, not at all annoyed. You are not the only one who is not peeved, Fiona. The corporate stand was almost deserted today with vast numbers of seats unused. I feel a national inquiry coming on. Surely they could let people in on spec to use up the seats? These empty seats happen over every big international prolonged event and I find it shocking..Methods on issuing tickets need to be looked at!! They do. I think questions are already being asked: I wonder if they will be answered in time to fill a few seats? Excellent – really pleased that you had a good day at Eton Dorney. Just found the Niger rower’s clip on the BBC website, and how lovely it was to hear you all clapping and cheering him on. True Olympian stuff! It is really well organised with very little stress. Loads of toilets. Buses are there when you need them. There is a river ferry too: not sure where that goes from, but I would have taken it had I known about it.Quite a long walk from the car park, bearing in mind possible mobility problems but there are facilities for the disabled. Thanks Kate – will pass this along. Good news is that they won’t have train tickets to drop, as they’re staying in Windsor the night before they go! I’m impressed with the ease with which your afternoon passed off. The rowing would have been my choice. I am not a sporty person, Roger. I grudgingly told Phil that the rowing was the least odious of the sports to go to, and he had chosen well. But it was well organised, and very well commentated. And I had a large and satisfying picnic. There is nothing like seventies style cocktail sausages to make a morning fly by. Thank you for giving us a first-hand look of the Olympics. I love that the Nigerian participated and the crowd was rooting for him. That’s what the games should be about: cheering the athletes. A few of the photos showed up nicely, Kate. But many of the others did not enlarge. Maybe it was me. No, probably universal: I’d love to make that window bigger….anyone out there able to help me, a self-confessed techophobe? I don’t know how to make all the pictures bigger, but you can enlarge a view of them by pressing control and the plus symbol on your key board a few times until the photos are larger. To reverse do control and – together. It all sounds great. The country is stepping up to the challenge! It is. He had no earthly chance of winning, but the spirit as everyone cheered him on was fabulous, Sidey. I’ve been looking forward to your stories about the Olympics. I can’t rely on our media to pick up the stories I was to hear — like the Nigerian rower. That’s what the Olympics are all about. I’m off to read more about him (her?) and look forward to more such stories from you. Just read your post, PT 🙂 So chuffed the tip-off was useful! It’s great to get a personal account of this, thanks! It must have been so exciting to root for the Nigerian rower. That really is the sort of thing that makes the Olympics special. It was. I feel very fortunate to have been at one of the events where this sort of story came out. Do remember Eddie ‘The Eagle” Edwards? Another classic. I know that you all think letting the Nigerian rower in is great but what about all those people who train for years and miss it by a second and they don’t get afforded that same opportunity to say I’ve been there!!! Very good point, Lisa. It is easy, as we bask in the warmth of an underdog story, to forget those who dedicate their lives to achieving the best in their field at this peerless event. Just one second can mean the difference between success and failure. Well . . . it’s not the Downton Abbey post I’ve been looking forward to (now postponed to the 7th?) . . . but a rousing good read re rowing. I read it to BFF. Yup, postponed till the 7th- Muggins here managed to double book two of the most important events in the family’s life. You should have seen Phil’s face when I said Downton Abbey was scheduled for the same morning as this hallowed event. And the Highclere people don’t give transfers or refunds (grrrrrrr). However, Maddie, Felix and I shall be going to Downton the morning of the 7th August. Huge apologies for all those Downton fans out there. You’ve all been waiting a while. How wonderful and fortunate you have been. ‘H’ was a big rower in his youth and I would run along the towpath shouting him on – he says lucky you, and Hamadou Djibo Issaka did very well to keep in line – ‘H’ says it is very difficult when you are a new sculler. Thank H for the insider information, Rosemary. It seems metaphorical mountains have been scaled in three weeks! It is so exciting to hear of your Olympian adventures, Kate, and I”m anxious to see what more you saw this day. I haven’t seen Hamadou Djibo Issaka’s fete as yet, but know I will be inspired. pretend-Britain 🙂 Great photos too ! Thanks Nicola. Are you going to any events? You will be struck by the uncharacteristic courtesy of the welcoming committee! A lovely Olympic ‘taster’ Kate! Hamadou Djibo Issaka: not a winner but the star of the day. Excellent. I do love it when an unexpected story just hoves into view, Jan.
Just watching the news. They’re giving tickets to students, teachers and the military. Everyone else must just watch the vacant seats. Grrrrrrr. I love that bit about the rower from Niger. Those are true Olympic stories. Did you know there was once an Irish rower who stopped to let a family of ducks pass, and he still got a medal?! How brilliant. I never knew that Ellie, thanks! Must go away and google to find out more! I can just picture the setting. Wish I was there. I love England and rowing. Such a great sport. Thanks, MJ. Oh, what I would have done for a really excellent professional zoom lens! You would have loved it. The atmosphere- it was just totally exuberant. How wonderful! Sounds like a great event to have attended. Can’t wait to hear more about the experience. It was great, Patti. Next post up now! Just back from London, and calming down after the trip home (all well on the train) – Scout went to Judo with Cyclo, while I went elsewhere with a friend! A lovely friendly feeling in London, on the tube and everywhere! Glad you had a good time at the rowing. We have seen a fair bit of rain today. Pseu, you must be right in the thick of it – did I hear Cyclo is volunteer stewarding? It held fine, more or less, all morning at Dorney. We were lucky. 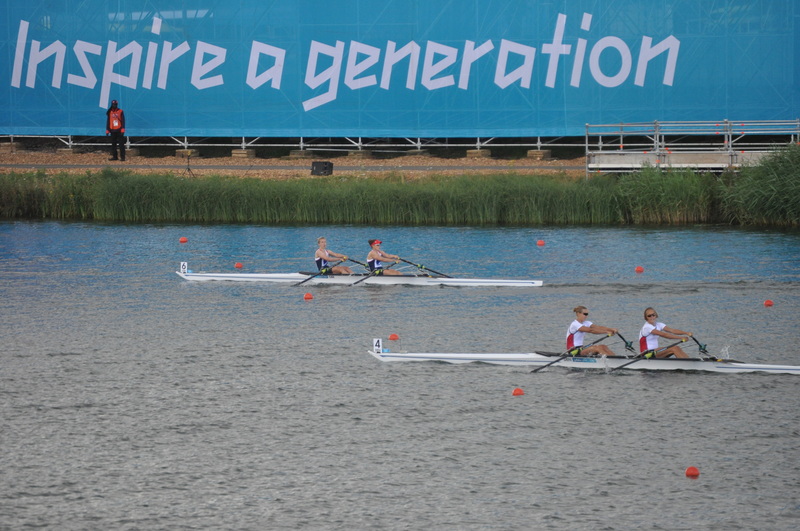 We watched them battle out GB mens rowing team, Celi. I shall be on special look out for NZ spectators from now on! 😀 It was great, Jas! This is one of the events I would love to watch live! I can believe how terribly easy it is to be drawn in and swooped into such pride. We found this with Vancouver. But it’s unimaginable for me to imagine London with the Olympics in full swing. I’ve visited twice and felt like a gold medal winner both times for having maneuvered my way around successfully! Look forward to your experiences, Kate. p.s. I heard about the empty seats on CBC – and about the direction to change a few things immediately. Hard to gauge the decisions of people to whom tickets are handed without any effort or pinch. I don’t watch tellie so I must find a video on the net about this rower. So much to talk about, Amy, and so little time!. If you can believe it, London has become simpler. We have signposted everything within an inch of its life and you would think people are being given bonuses, the smiles and good humour and helpfulness we are encountering. The ticket business is a blight, though. Empty stands are not nice to look at and so many of my friends have missed out. I’m way behind with my reading, but want you to know how much I’m enjoying your insider’s take on some of the excitement….we’ll surely get little of that from NBC, at least until time for the endless prattle by talk show hosts, long after the fact! As usually happens, your writing paints pretty vivid pictures, and the photos just enhance the whole! Thanks! Hi Karen 🙂 S’ok, I’m way behind with my answering! Apologies! Britain is not always quite as amenable as this. Ahem. What a great day. Doesn’t it feel like a win when everyone joins together. It’s great to have the inside view. Keep posting for us. Will do, Barb. It’s so rarely the nations come together like this. We only go to one or two events at most here, Debra, and the rest is through television and Facebook and Twitter and all the other ways of linking up. It’s a brave new world when you can tweet athletes to wish them good luck! Absolutely love the part about the Nigerian rower. Now that is truly what the Olympics are about. On behalf of those of us “across the pond”, thank you for sharing this story! Thanks for bringing the Olympics a little closer, Kate. It is ever so much better than #NBCFail. You made it look like so much fun! Wish I could be there. Lovely – I ran and reran the slides. Grateful to you for doing more than just perch in front of a telly. With you part of the action, I feel I get a slice!